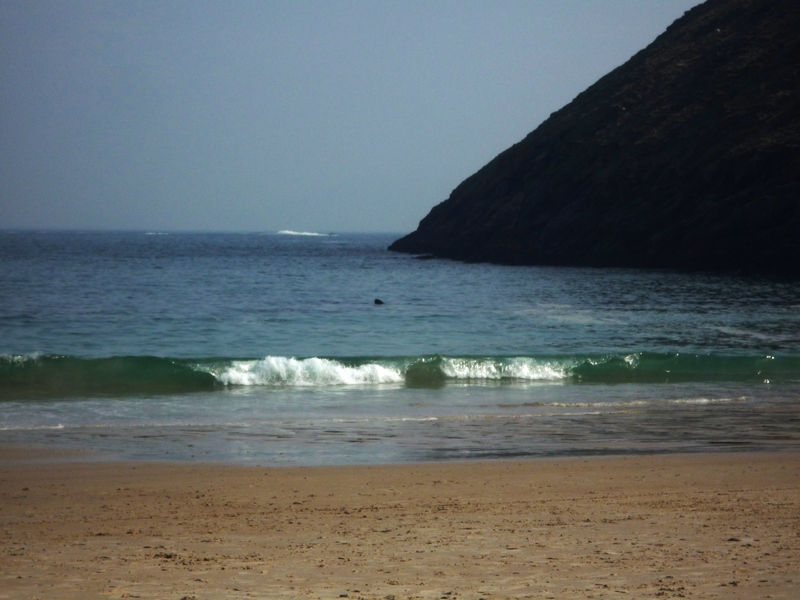 In this Blog, we will take a quick look at Keem Bay that is located at the very western end of the island and has been rated as one of the most beautiful places in County Mayo, perhaps even in the whole of Ireland! It is a favourite spot of our students and we always try to ensure that they get to spend some time there to relax, have a swim or just enjoy the scenery. Keem Bay also contains a number of interesting historic buildings and some really intriguing archaeology. 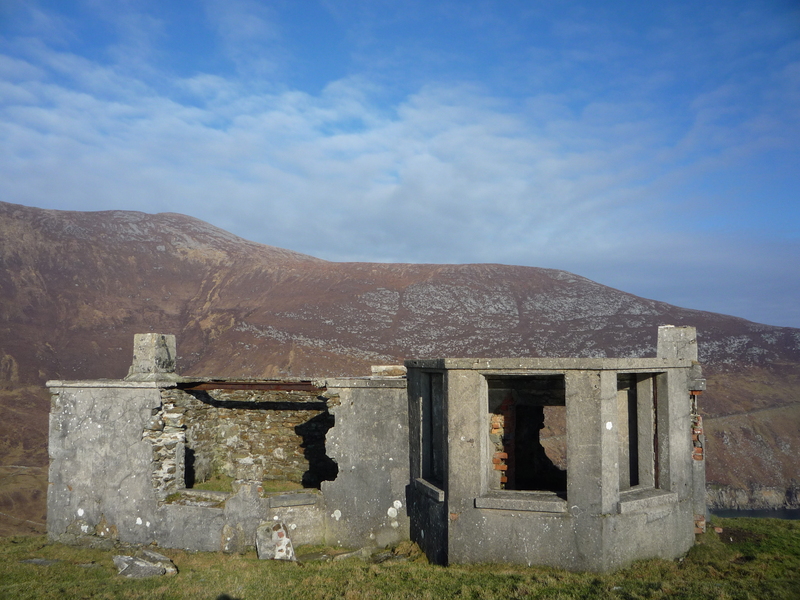 The research carried out by the Achill Archaeological Field School at these sites over a number of years will be published by the Field School, in monograph form, in late 2014. Keem Bay is reached by a high and winding road cut into the south western flank of Croaghaun, Achill’s tallest mountain which peaks at 688m. The views during the descent into the bay are spectacular, a curving beach of pale yellow sand, the sea an alluring green and beyond the ground rising steeply up to the cliffs at Moyteoge Head. 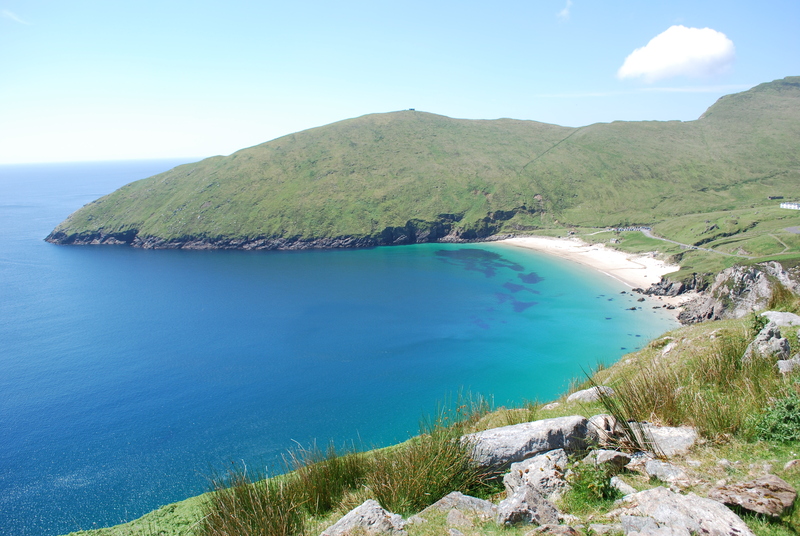 Behind the beach there is a steeply sloping valley that rises up to a high pass; to the west is Achill Head, the rocky peninsular that forms the most westerly point of the island. A series of small streams drain the valley of Keem, running in steep sided gorges before spilling out onto the beach where they provide endless entertainment for children during the summer. From the vantage point of the road two buildings stand out, the huge white mass of a Coast Guard Station overlooking the beach and the silhouette of a Look-Out Post on the summit of Moyteoge Head. The Coast Guard Station was constructed around 1910 and is actually a small terrace of houses for four separate families who would maintain the watch in shifts. There is a large levelled garden to the front of the building and a row of out buildings to the rear. It was constructed as a replacement for a simpler building believed to have been constructed in the 1830’s, the ruins of which can be found near to the stream running down the western side of the valley above the beach. The look-out post on Moyteoge Head is a favourite destination for visitors looking to get a view of the rugged cliffs that fall away into the Atlantic to the west. 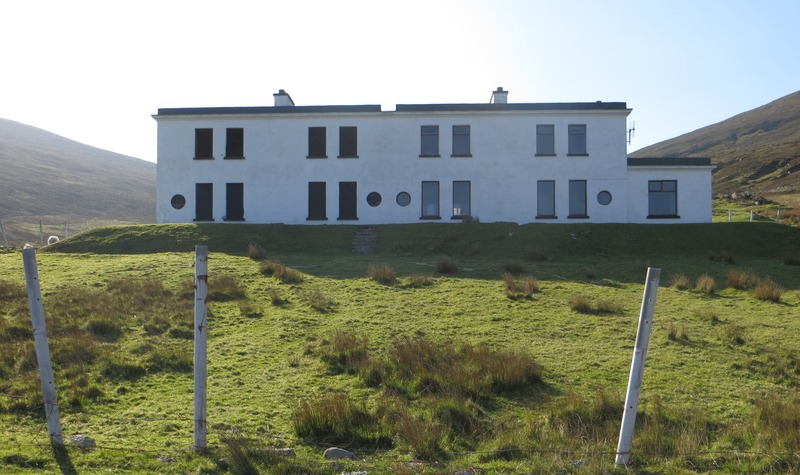 This building was in use during World War 2 to track the movement of ships and aircraft along the coast, and to take meteorological observations. Similar sites were used all along the Irish Coast generally located on exposed headlands and promontories. The vital information gathered by this network of Look-Out Posts was surreptitiously passed onto the Allies, an extremely risky undertaking for officially neutral Ireland. Typically these buildings were constructed using a pre-fabricated kit of 137 concrete blocks, but this example seems to have been modified from an earlier building used by the Coast Guard. Down at the Beach there are several small buildings associated with the fishing industry in Keem Bay. The most famous aspect of this industry was the hunting of Basking Sharks which began in the 1940’s and continued into the 1970’s. After ensnaring these plankton eating giants in nets the local fishermen would approach in Currachs and dispatch the sharks using harpoons which according to one of the surviving fishermen, Michael Gielty, were fashioned out of the leaf springs from car suspension systems. The sharks were essentially inedible but the massive livers contained oil that could be refined and exported whilst the fins were sold into the oriental food market. The shark fishing halted due to over fishing but thankfully numbers have slowly recovered and occasionally large groups can be seen in Keem Bay during the early summer. 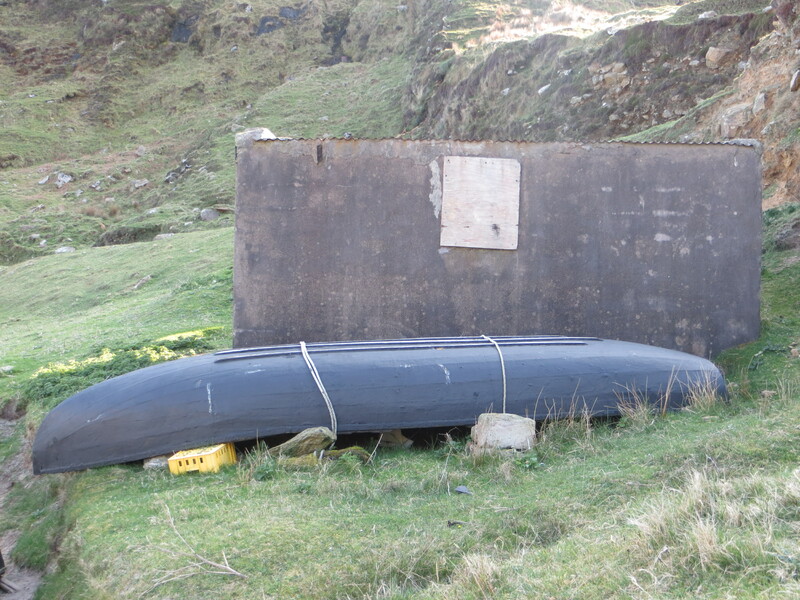 The Currach is a traditional wooden boat covered with tarred animal hides to keep them waterproof. A couple of examples of these distinctive black vessels can usually be seen behind the modern life guard hut on the way to the beach from the car park. A rusting orange boiler used to refine the Shark Liver Oil can be seen at the back of the beach close to where one of the small streams reaches the sands. Achill Archaeological Field School runs a variety of archaeological courses that are suitable for archaeology and anthropology students, professional archaeologists and inquisitive members of the public. Courses range from a one-day archaeological research taster course to advanced and specialist courses including a highly-regarded trainee archaeological supervisor course. Visit our website at http://www.achill-fieldschool.com for details of all of our courses and information about the many exciting projects we have undertaken. Residential and non-residential options are available throughout the summer. 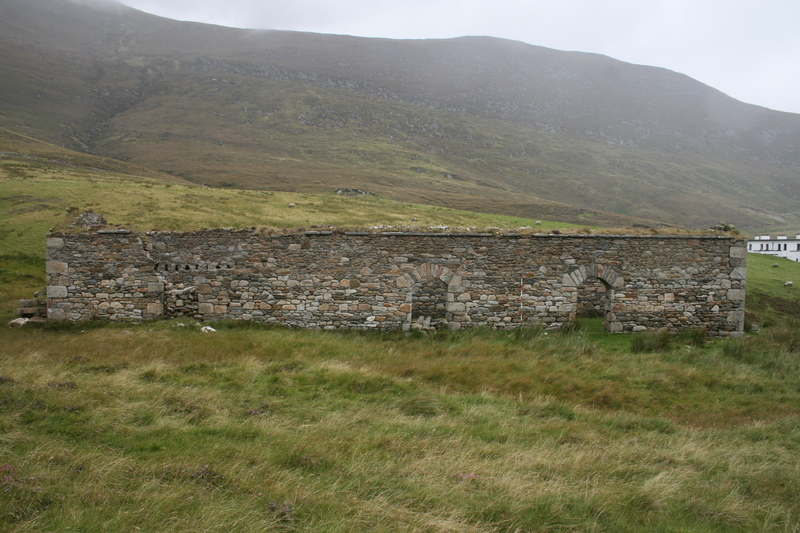 We also specialise in Guided archaeological tours of Achill and the Corraun Peninsula. My Great Grandfather and namesake Thomas Donnelly, his wife Bridgett and 7 or 8 children left Achill Island in the late 1800’s to build and maintain the railroads in southwestern Wisconsin. Whole communities ended up together in small railroad towns across the region. 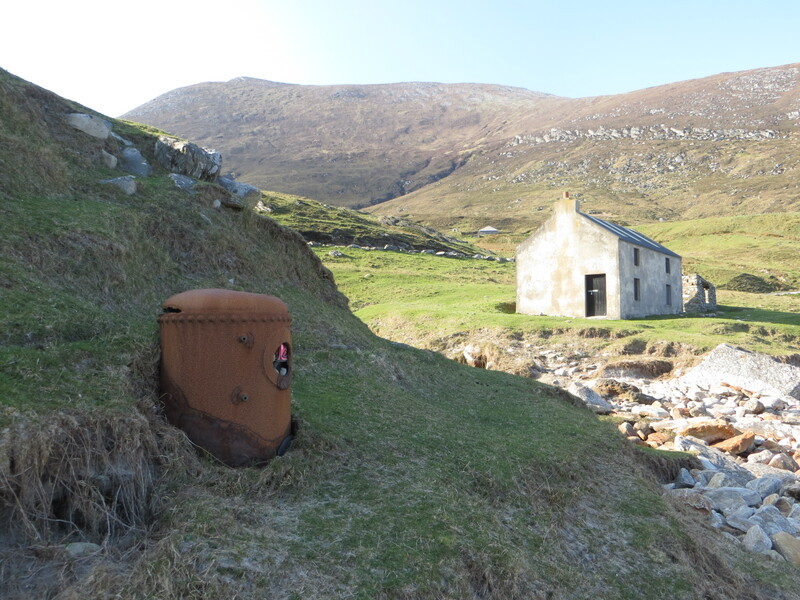 Do you know which village in Achill your Grandfather was from? The Achill Field School has just completed a survey of the old Graveyard in Bunnacurry and there is a Donnelly listed on one of the gravestones.